Mumbai: Application for Height exemption permission to install overhead cables forMumbai Metro Rail Junction has been withdrawal by Mumbai Metropolitan Region Development Authority (MMRDA). Height clearance granted in March would cause no safety issues for Juhu Aerodrame, said Airport Authority of India (AAI). MMRDA mainly took decision to withdraw application after this statement of AAI. Metro 2B route which is passing through a funnel area of Juhu Aerodrome, along SV road in santacruz, MMRDA wanted height exemption for part of elevated corridor. 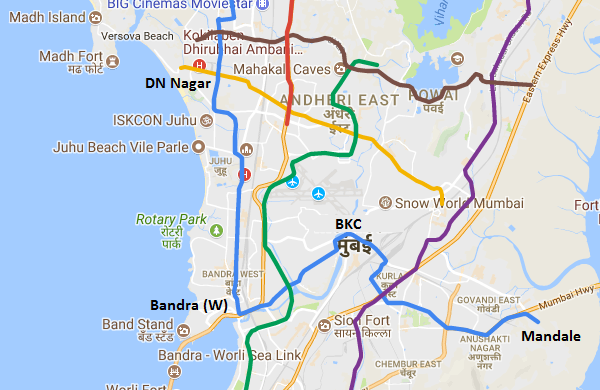 This route is being implemented by MMRDA. On 13 July a division bench of justice SC Dharmadhikari and Bharthi Dangre allowed MMRDA to withdraw it application. An email was forwarded by the AAI offices and signed by general Manager (ATM-NOC) New Delhi. Which was later informed to High Court by Shilpa Kapil. A grant of NOC for height of 16.76m AMSL stands was mention in email. Since a 2014 PIL by Yeshwant Shenog on height restriction was already disposed of by the High Court in April- lifting a two year embargo on aviation authorities deciding on application for height restriction exemption in buildings in the vicinity of the airport- MMRDA may withdraw the case, it mention in the email. When MMRDA view the email, MMRDA counsel S B Talekar sought to withdraw the plea and court allowed its withdrawal S Mangala senior AAI office was present in court. ON March when AAI has granted NOC, MMRDA had moved to High court as previous approval was necessary. At first hearing when High Court could not receive email from AAI, it soughed on AAI as AAI is putting their workload on HC instead of finalizing it. The article is written in very poor English. It is very difficult to comprehend and the grammar is bad. Mohit please once again properly read the story. There is no such grammatical mistake and the story is written in very simple language which is understandable by everyone.